Earth Mama Angel Baby, online at earthmamaangelbaby.com, carries organic herbal products that supports mothers and babies through the entire birth process. Earth Mama Angel Baby offers great deals on organic herbal products that are safe for babies and mothers. Earth Mama Angel Baby carries morning wellness tea, stretch oil, heartburn tea, third trimester tea, body wash, lip balm, bath herbs, healing salve, shampoo, baby oil, soaps, and gifts. Check out RetailSteal.com for the latest Earth Mama Angel Baby discounts, Earth Mama Angel Baby promo codes, and Earth Mama Angel Baby coupon codes. Earth Mama Angel Baby offers shipping promos that change often. Stop by RetailSteal.com for the latest Earth Mama Angel Baby shipping special offers. 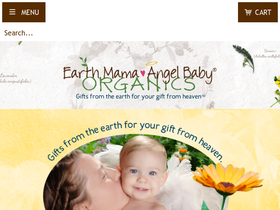 Earth Mama Angel Baby offers standard and express shipping options. Earth Mama Angel Baby ships to the United States and worldwide. Shop at Earth Mama Angel Baby to save 25% on any order. Click for code. Use code to save 20% on any order at Earth Mama Angel Baby. Click here for code. Save 15% on any order at Earth Mama Angel Baby. Click here for code. Save 10% on any order at Earth Mama Angel Baby. Click for code. Use code to save $2 on soaps at Earth Mama Angel Baby. Click for code. Enjoy free shipping on orders $49+ at Earth Mama Angel Baby. Click here to shop. Enjoy a free e-Book download at Earth Mama Angel Baby. Click here now. Enjoy a free birth plan at Earth Mama Angel Baby. Click to shop.